We are happy to present the new and extended Woodfire Technical range. Woodfire Technical stoves offer a wider choice of different models as well as improvements in design and efficiency. We are pleased to announce the arrival of the new Woodfire Technical range of stoves. Woodfire Technical are all dedicated woodburning stoves designed to burn wood, and only wood, efficiently. There are two freestanding models with the rest being inset stoves. For the inset stoves there are Lifting Door (LD) versions where the door slides up and into the wall to open, and there are Double Sided (DS) versions where you can see the fire in two rooms at the same time. 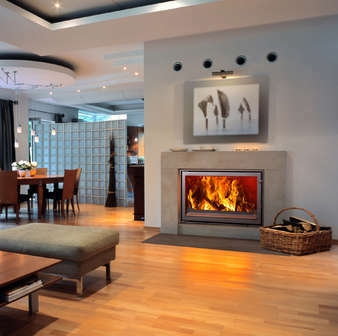 Heat is of course passed from the Technical inset stoves directly to the room they are installed in but, with the addition of an optional convection cover, heat can be ducted to other rooms in the house. Woodfire Technical inset stoves come in three main groups: RH, RX and EVO. RH are a series of woodburning inset stoves in a wide range of sizes right up to a model with door over 1.3m wide. The RH stoves are dry, non-boiler, woodburners. RX are inset boiler models with a wide range of outputs up to 40kW. RX stoves can be installed on pressurised or open vented systems. EVO are modern inset boiler stoves with outputs up to 30kW. The door and frame design is minimalist giving a great view of the flames. All the Evo stoves feature double glazed stove glass. There are two Woodfire Technical freestanding stoves; the CX12 and the CXC 12. Both give 9kW to water and 1.89kW to the room making them ideal for well insulated houses.